It is getting colder and I'm knitting lots of stuff to make my Little Man ready for the winter. And some warm socks are a must-have thing, so I made a couple of pairs and can share the pattern with all of you. Cast on 32 stiches and divide them between 4 needles. You have to cast on really loosely, so I would adwise to cas on on two needles (just put them together and acst on as if they were one, then remove one of the needles and divide the stitches between four needles). There will be 8 st on each needle then. We'll work in rounds starting with the 1x1 rib. Round 1: *k1, p1*, repeat from * to * till the end of the round. then work only on first and second needle, which means - with 16 st. Take them to one needle and work in rows. Row 26 - 33: repeat row 24-25. And you'we done the heel! Now you have 8 st on the heel. Take the first st off the holding needle to the working needle and knit that 7 remaining st from the top of the heel, then cast on 10st along the left side of the heel, knit the stiches from 3rd and 4th needle, cast on 10 st along the right side of the feel and knit 4 st from the top of the heel. Now you should have 14 st on the 1st needle (10 from the side of the heel and 4 from top of the heel), 14 st on the second (the same as on the first one), 8 st on the 3rd, 8 st on the 4th. Round 43: ssk, knit 12 (first needle), knit 11, k2tog (second needle), knit 8 (3rd needle), knit 8 (4th needle). Round 44: ssk, knit 11 (first needle), knit 10, k2tog (second needle), knit 8 (3rd needle), knit 8 (4th needle). Round 45: ssk, knit 10 (first needle), knit 9, k2tog (second needle), knit 8 (3rd needle), knit 8 (4th needle). Round 46: ssk, knit 9 (first needle), knit 8, k2tog (second needle), knit 8 (3rd needle), knit 8 (4th needle). Round 47: ssk, knit 8 (first needle), knit 7, k2tog (second needle), knit 8 (3rd needle), knit 8 (4th needle). Round 48: ssk, knit 7 (first needle), knit 8 (second needle), knit 8 (3rd needle), knit 8 (4th needle). Now you should have 8 st on each needle. Knit 24 more rounds with no decreases. NB! This quantity of rows is calculated from the average lenght of baby foot at this age, which is 12.5 cm. But please note that all babies are different and some of them can have much smaller or bigger feet at the same age. For example, Little Man is only 11 months old, but his feet (well, the whole baby in fact) are quite big, exactly 12.5 cm. So, before you start knitting I would advise you to measure your baby's feet and adjust this part to your baby's actuall size by knitting more or less than 24 rows. Round 6: knit every two st together (1 st on each needle). You will have 4 st left. Cut the yarn leaving 10cm long tail. Using the tapestry needle sew the last st together and hide the yarn ends. Repeat for the second sock! 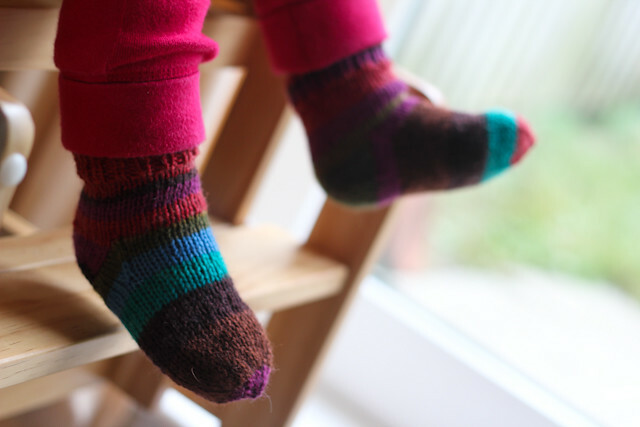 If you knit some socks using my pattern, please leave a link to the picture of your creation in comments. I'd love to see it :) And please let me know if you find any mistakes in the pattern too.